Discussion in 'Skydentify - What is that Thing in the Sky?' started by Mick West, May 14, 2018. The first impression was correct. However the resultant photo seems at little confusing. The problem is that you naturally interpret this as a set of three lights. But what it actually is is a single light, the red collision avoidance strobe. This is a very bight flashing light, and illuminates other parts of the plane, even in daytime. In this case it's illuminating the engines. The time given is 2018-05-08 8:59PM, that's 2018-05-09 (next day) 2:59AM in UTC. The camera exif time gives the same UTC time - maybe that's common for astrophotography? Looking at that location a likely candidate is SWA1988 from Phoenix to Omaha, which was passing just to the South at 39,000 feet. Another thing that throws people off here is the thin lines. These are the long exposure traces of navigation lights, but seem odd as you can only see two of them, and they don't seem to line up with the other lights. However if you look carefully, or just boost the levels, then you can see there actually are three lines. What's more the one of the left is green and the on on the right is red, which matches standard wingtip lights. They don't line up for a somewhat unintuitive reason - planes do not fly in the direction they are facing. The fly in the direction they are facing at their airspeed PLUS the velocity of the wind relative to the ground. So if there's a crosswind the motion of the plane can be 5° or more off from the direction it is facing. For a minute I wondered why the plane didn't block the stars behind it in the picture (or does it? ), but that is of course because it's a long exposure photograph. Excellent analysis. Looking at that overlay of the plane on the photo, there is no doubt this is what we are seeing. That's another thing that throws people off, even if they don't really think about it their brains assume it's a small craft because they can see all those stars. ... My subjects that night were a pair of galaxies in the spring sky, NGC4631 and NGC4656 in the constellation Canes Venatici. But if the camera is looking East, the if we align the photo with the night sky at that time, then it seems to suggests the plane was flying roughly to the West, not the same as the plane I'd identified earlier. TheOutThereChannel says's it's this 777, UA275. Time is a bit off, but the track matches. Nice work Mick, I love the detective aspect to this. I would say that the two red spots behind the strobe is the air ducts being illuminated. See video of Boeing 777 landing. Assuming the galaxy is 10' long as he says, the distance (in arcmin) between the engines is about 3' or 0.04-0.06 deg. I.e. the engines are about 26-40 ft apart. So the Boeing 737 and flight SWA1988 seems like the best candidate. Indeed this does confirm the galaxy ID and the coordinates at the center of the strobe light (12hr 42m 29.4s, 32d 36' 25") correspond to an alt of 67.3 degrees and an azimuth of 92.9 degrees at 2:59 UTC from Aztec, NM. Looks like your best estimate of 0.049 degrees was just about right on the mark according to my measurement, which as you show above corresponds to ~34 feet part give or take. Not bad. Someone did something similar in another thread, I just realised you could do the same here. In hindsight I think I made a mistake with x = X sin 67. I was thinking the plane was flying from left to right horizontally, but it looks more like it is coming straight at the camera, and in that case x = X. The reflections on the engines are probably a bit off center so 0.049 is a bit smaller than the actual engine separation. But you get about the same range anyway, so the conclusion is the same. Is there is a website where you can see historical flight data (for free)? Planefinder has older data for free. I've got pro accounts for free on Flightradar24 and FlightAware because I feed ADS-B to them, so I can get older data from them too. I can get track data for a particular flight back to about 6 months, but I can't replay all flights for a particular date and time, as far as I know. Here is UAL275. I tried looking at planefinder but it looks like planes appear and disappear suddenly. Is it because they get their data from ADS-B and there is not good coverage everywhere? It looks like it was only a few km from the camera position so the plane must have flown very close to Aztec. Isn't the position of the camera a known unknown? The unknown plane, if UAL275, has a known track . This would put him slightly north, and a bit west of the track of UAL27, somewhere in the bush about 20 km. north of Aztec? True, but it looks like UAL275 was also a boeing 777-200. If I'm right about it having about 70 ft between the engines then the angular separation of the engine reflections should be closer to 0.14 degrees. It's a pretty short flash, so I the image itself shows the relative size and spacing of the engines. If it's just the fairing being lit then it seems to fit the 737 better. But here's the 777 overlaid. Still plausible. A 777-200 would have an angular separation of 0.14 degrees at that altitude though, but Astro measured it to be closer to 0.049. 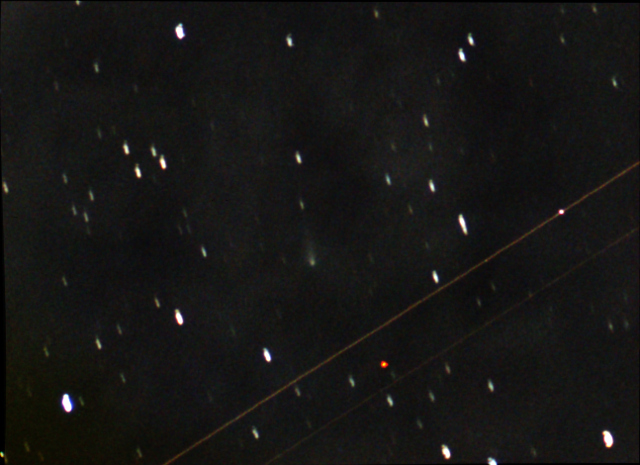 I just looked at the original photo, and noticed a second strobe flash, and a passing satellite? They should provide a bit more information to fix the location etc. Remarkable right angle there. I’d assumed it was another plane. But maybe not with the single light. The flash periods are probably quite accurate, although this is not a requirement, as I understand things. From the speed of the plane and flash period you can get a distance scale and distinguish Airbus and Boeing by comparing to wing span. You should be able to get camera Latitude by adjusting the viewer position in Stellarium until the satellite track and stars line up where they are supposed to be. The exposure time span must include the satellite position/time. Because of a long exposure and speed of a satellite the longitude would not be very precise. I am on a backup PC so I don't have it available now. If that's the strobes, then the yellow lines provides a measure of the wingspan which is much easier to find data on for different aircraft type (than the engine separation). We can also measure the distance between flashes, but we don't know the frequency. I assumed the red beacon flashes 1 time per second just to see what figures one would get, and they look sensible in that case. If choosing between a 737 and a 777, the numbers fit a 737 the best (wingspan of about 100 ft). The 777s wingspan of 200 ft would put it at an altitude above 60'000 ft. If it is a double wing tip flash then it is an Airbus. We could do with an adjacent frame to confirm. Yes, it looks like it matches the flash pattern. I only managed to find Spirit 185, but the time/ location seems to be wrong for that to be it. Very nice analysis! From the light flash sequence, the Planefinder research, engine placement vs. arc, to my favorite...the crab angle against the wind aloft! At first it was bugging me that the single white NAV-light wasn't in line with the anti-collision light. Assuming it's not already offset (or parallax, up high on tail? ), that's a decent crab angle. This can be calculated too using an E6-B flight computer. Wind aloft history is available at http://aviationwxchartsarchive.com/product/windc however we seem to be past the archive window for May 9th. to request for the wind aloft archive May 9-10. They say give it 24 hours. Oops, I should have done May 8-9. I added a day to comply with ZULU, but that was already done. They only allow one archive request per email. Unless someone else is interested in submitting a request, I'll wait a few days and try again. Well the wind data never arrived. Still, making some assumptions, an an aircraft doing 400KTS on a 270 track(due westbound) would be heading of 278, and the wind would be out of the north at 56KTS. Just eyeballing it with a paper protractor overlay (limited computers here at work, someone with Photoshop please help) the flight track vs heading in this photo seems about 8 degrees off. The wind data finally arrived. At 0000Z that night at FL300 the (forecast) wind was 330@40KT. The track (in the posts above) appears about 250. So that should be a 5 degree correction angle at 450KTS (increases to 6 degrees at 400KTS).